The Standby Volunteer Task Force (SBTF) recently launched a new team called the Satellite Imagery Team. This team has been activated twice within the past few months. The first was to carry out this trial run in Somalia and the second was in partnership with AI-USA for this human rights project in Syria. We’re now back in Somalia thanks to a new and promising partnership with UNHCR, DigitalGlobe, Tomnod, SBTF and Ushahidi. 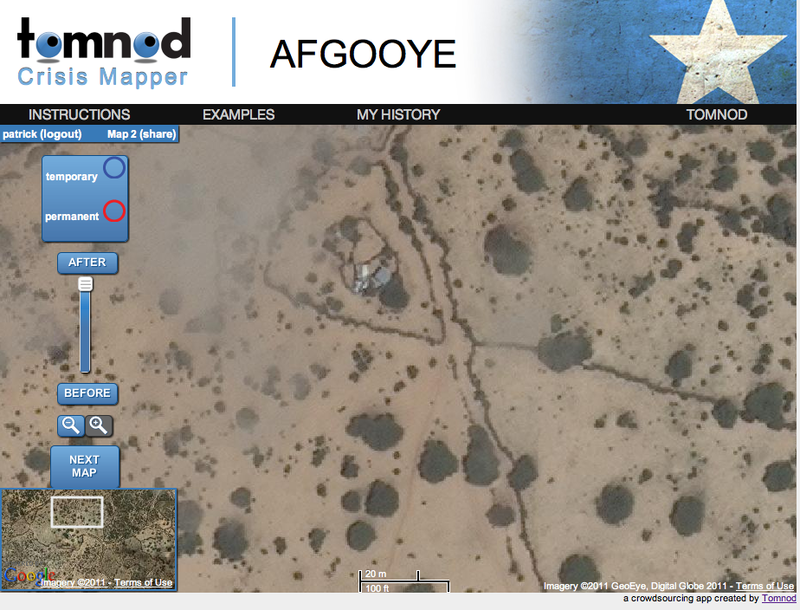 The purpose of this joint project is to crowdsource the geolocation of shelters in Somalia’s Afgooye corridor. This resembles our first trial run initiative only this time we have developed formal and more specialized rule-set and feature-key in direct collaboration with our colleagues at UNHCR. As noted in this document, “Because access to the ground is difficult in Somalia, it is hard to know how many people, exactly, are affected and in what areas. By using satellite imagery to identify different types of housing/shelters, etc., we can make a better and more rapid population estimate of the number of people that live in these shelters. These estimates are important for logistics and planning purposes but are also important for understanding how the displaced population is moving and changing over time.” Hence the purpose of this project. We’ll be tagging three different types of shelters: (1) Large permanent structures; (2) Temporary structures with a metal roof; and (3) Temporary shelters without a metal roof. Each of these shelter types is described in more details in the rule-set along with real satellite imagery examples—the feature key. The rule-set describes the shape, color, tone and clustering of the different shelter types. As per previous SBTF Satellite Team deployments, we will be using Tomnod’s excellent microtasking platform for satellite imagery analysis. Over 100 members of the SBTF have joined the Satellite Team to support this project. One member of this team, Jamon, is an associate lecturer in the Geography Department at the University of Wisconsin-Madison. He teaches on a broad array of technologies and applications of Geographic Information Science, including GPS and satellite imagery analysis. He got in touch today to propose offering this project for class credit to his 36 undergraduate students who he will supervise during the exercise. In addition, my colleague and fellow Satellite Team coordinator at the SBTF, has recruited many graduate students who are members of the American Society for Photogrammetry and Remote Sensing (ASPRS) to join the SBTF team on this project. The experience that these students bring to the team will be invaluable. Shadrock has also played a pivotal role in making this project happen: thanks to his extensive expertise in remote sensing and satellite imagery, he took the lead in developing the rule-set and feature-key in collaboration with UNHCR. The project officially launches this Friday. The triangulated results will be pushed to a dedicated UNHCR Ushahidi map for review. This will allow UNCHR to add additional contextual data to the maps for further analysis. We also hope that our colleagues at the European Commission’s Joint Research Center (JRC) will run their automated shelter tagging algorithm on the satellite imagery for comparative analysis purposes. This will help us better understand the strengths and shortcomings of both approaches and more importantly provide us with insights on how to best improve each individually and in combination. This entry was posted in Crisis Mapping, Crowdsourcing, Satellite Imagery and tagged DigitalGlobe, IDP, SBTF, Shelters, Somalia, Tomnod, UNHCR. Bookmark the permalink. I’ve been thinking… if the volunteers are also able to tag where there’s cloud in the images (unfortunately common for African images) – perhaps by dragging polygons around it – that could also be useful data for where to grab new satellite imagery or send over UAVs/ overflights. Maybe not so practical in Somalia, but could be useful for helping with less shooty crises. We all know how useful a satellite images nowadays. It is clearly evident that it can help us when it comes to location informations and studies that might help us to solve some issues. This article seems interesting as it aims for something better that may help a lot of people. Great Job!